Having a small business is exciting; you’re your own boss and the primary decision maker. To that end, having a small business is exciting, but it’s also time consuming and tough. Since you’re the primary decision maker, your business’s success rests on your shoulders—and that’s a lot of pressure. The best way to make sure you succeed is to get your name out there and build your brand. Choosing the best route to market your business can be overwhelming and expensive. Like many small business owners, your resources might be limited. 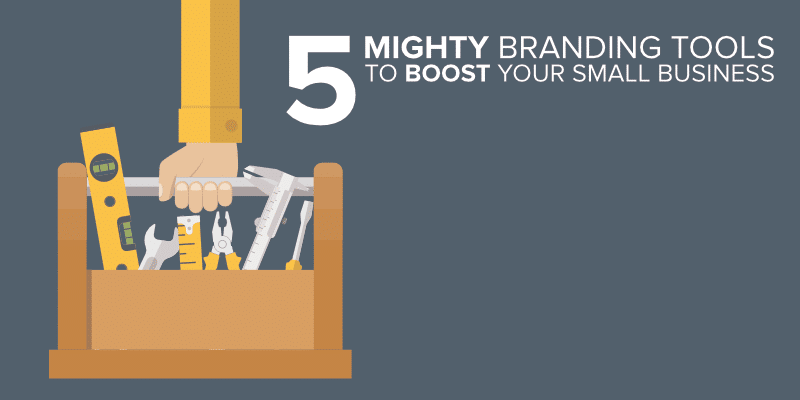 For help, check out these five budget-friendly branding tools to grow your business. Offline and online marketing are equally important for your brand. The most important online tool is a website. Your website will introduce people to your brand. Depending on your budget, you can hire someone to design your site or use other services available to create it yourself. In addition to allowing customers the convenience of purchasing goods and services online, your website can provide other resources—most notably, your blog. Your blog will help establish yourself as a thought leader in your industry and boost your credibility. It shouldn’t focus on self-promotion or product reviews. Instead, it should offer your audience comprehensive answers to their questions that no one else can provide. You also should provide free resources to your audience to make life easier. Include infographics, videos and custom images, too, to break up the text and help illustrate key points. Be authentic and honest in your posts to let your personality shine through. This builds a stronger connection with your audience, which is important because people typically only do business with those that they trust. Ask other bloggers and influence to create content for your website, too. This will help get your site in front of a broader audience, as they will share their posts. You can build on the connection you’ve started with your audience through your blog with social media. Social media allows customers to connect with brands on a more personal level. Be sure to respond to their questions and comments in a timely fashion, even it’s negative. This shows you value your customers’ thoughts and willing to work with them to deal with issues head-on. While social media is valuable and costs little, it is important to focus on the most relevant networks. Trying to have a presence on too many platforms will take up too much time and might not be completely beneficial if your audience isn’t using them. That’s why it’s important to research your audience to find out which platforms they use the most. Focus on those platforms with additional research to determine the best time to post and what types of posts are most successful. Make sure your posts explain why the content is important to your audience. Use custom images to make them stand out in people’s newsfeeds. Bright, bold colors such as red and orange create a sense of urgency and get people’s attention. Lastly, use social media to connect to other influencers in your industry. This helps build your credibility and get your brand in front of their followers, too. Now that you’ve made a connection with customers online, it’s time to get out and speak to people face-to-face by becoming a guest speaker. Be sure to include information about your company and brand in addition to just your products or services. Let the audience get to know a little about you. Create branded binders full of supplementary materials to hand out to attendees. Include a few blank pages so audience members can take notes from your speech if they would like. Don’t neglect visual branding; notice how the bright, contrasting colors on the front cover of this example continues on the inside and the back, leading viewers toward the company’s contact information. Share stories and engage your audience during your speech to build your relationship and keep them interested. It’s OK to use a slide show as a supplement, but do not read from it. Hone your presentation skills and keep it simple by sticking to three points so the audience will remember it. Record your speech to share on social media later for those who missed it. One of the most important branding tools you’ll need as you meet people is business cards. The shelf life of your business card will depend on its design. Unique or useful designs live longer than plain, standard cards. Your business card is one of the first impressions people get of your company and your brand. It should be consistent and match all of your other marketing material, including your website and social media. By including your website and social media links or a QR code, your business card can build a bridge between your offline and online marketing material. One way to ensure people will hold onto your business card is to give it a purpose. You could use the back as a punch card for a loyalty program, or include useful information such as dates of all of the holidays if your business is a gift shop or florist. Alternatively, give it an actual function by making it a magnet or putting a ruler on one of its sides. If you’re going to be on the road to those speaking engagements, why not beef up your vehicle? It could be as small as a bumper sticker or magnet on your vehicle, or large as a window decal, custom graphic or wrap. Making your vehicle a mobile billboard is a great way to build brand awareness for your business. Not only will local people regularly see it if they share your commute route, it will reach an even broader audience when you take longer road trips to conferences, trade shows and other speaking engagements. It will be especially hard to miss if traffic is slowed because of construction or some other incident. The same principles apply to this as your other marketing materials, in that it should be consistent with the same logo and color branding as your store front, business cards and website. Be sure to include your company contact information and website, too. You even could have a contest in which people post photos of your vehicle with a hashtag when they spot it. The possibilities are endless. Starting a small business is a lot of hard work and money. You’ll want to make sure any branding tool you select gives you the most return on your investment, whether that investment is time, money or both. It’s also important to be consistent with your message and look across platforms. Growth for your business won’t happen overnight. Hopefully, with the help of these tips, you’ll see positive results without breaking the bank. Lori Ohman works with businesses and individuals in assisting goal achievement, change implementation and success strategy. After completing her degree in Business she began working with small business to help implement changes. Eventually, she found herself working with individual people as well, focusing on personal development and change management.